April 26-28, 2019 at the Superhero Foundry, 3155 W. Post Rd in beautiful Las Vegas Nevada. “When you play the Game of Throws, you stick it or you lose.”- Cersei Lannister’s coach. Late registration, throwers number assignment and scorekeepers recap at 8:30 a.m.
Golden Aces Knife start at indoor range 9:00 a.m.
Silver Aces Axes start at outdoor range 9:00 a.m.
End of Golden and Silver Aces competition at 5:00 p.m. The Killer Grand Prix at 7pm. All teams must be ready at 6:30pm. Scorekeepers, announcers and camera crew meeting at 6:30 p.m. Warm ups start at 7:30 a.m. at the outdoor practice lanes. Throwers and scorekeepers meeting at 8:30 am SHARP! Pro division starts conventional knife throwing at Indoor Range at 9:00 a.m. Amateur division starts axe throwing at Outdoor Range at 9:00 am. Pro division starts axe throwing at Outdoor Range at approx 12:00 p.m. Amateur division starts conventional knife throwing at Indoor Range at approx 12:00 p.m.
No Spin knife throwing starts at Indoor Range at approx 2:00 p.m.
End of Team Competition day at 5:00 p.m. The GOT Feast, Awards Ceremony and Auction starts at 7:00 p.m.
Blade Aces Certification Class starts at 8:00 a.m. – 9:00 a.m.
Games rules meeting starts at 9:00 a.m.
Silhouette starts at 9:30 a.m. Speed Throw starts at 9:30 a.m.
Roulette starts at 10:30 a.m.
Quick Draw starts at noon. Blade Aces Certification Practical Exam at 1:00 p.m. Student volunteers need to be available at 12:45 p.m.
Long Distance knife throw starts at 2:00 p.m.
Long Distance axe throw starts at 3:00 p.m.
Blade Aces Certification Rules class at 4:00 p.m.
Blade Aces Certification Written Exam at 5:00 p.m.
Games Awards Ceremony at 6:00 p.m. Knife Defense and Counter Offense Class from 10:00 a.m. to 1:00 p.m.
manufacturer of high quality USA made precision knives,” said Hogue managing partner Neil Hogue. tomahawks for the partnership that will make their debut at Sturgis. directly at 1-800-438-4747 or visit http://www.hogueinc.com to find a Hogue dealer near you. We’re looking forward to knife throwing going mainstream. This is what every knife thrower and organization has strived towards for years. This is an opportunity for all organizations throughout the U.S. and around the World to teach the masses about the great sport of knife and axe throwing. With this and future exposure, this is that moment we can see the light at the end of the tunnel. With more sponsors and support, it’ll only be a matter of time before the ultimate dream of many great throwers will be a reality….The Olympics. Summer is in full SLING! The Las Vegas Slingshot Association (LVSA) is excited to be working with Blade Aces at the Super Hero Foundry in helping grow the sport of slingshot/catapult shooting here in Las Vegas. The popularity of slingshots, also known as catapults in Europe, is quickly making a resurgence worldwide as people of all ages compete in this friendly sport of marksmanship. Tournaments are held weekly throughout the world organized by various local slingshot/catapult organizations. The use of a sling to launch a projectile as a weapon or tool for hunting and protection has gone back before the biblical times of David and Goliath. Today’s modern sling shooters utilize modern materials such as highly elastic and weather resistant latex compared to the old rubber inner tubes. The sport of sling shooting is both fun and economical for men, women, and children of all ages. Slingshots can vary from a simple economical wooden frame from a tree fork with some rubber bands to more elaborate materials consisting of precision machined steel or cast polished aluminum or brass frames with various aiming devices and temperature resistant latex. There are numerous ways in which a slingshot can be drawn and how the projectile is released. Similar to many other precision sports, mental focus, form, and consistency are of utmost importance at highest levels of sling shooting. Scoring is straightforward and simple. Shooters aim at various sized targets from a distance of 10 meters (33 ft.) with a corresponding point when the target is hit/knockdown. Targets usually consist of solid targets which must be knockdown to score and/or steel plate backed Circular paper targets with various points given where a mark is left by the projectile onto the paper. Outdoor / field events are also quite popular as targets are set up from various distances and heights. Want to learn more about Slingshots / Catapults? Join the LVSA practice session every Sunday from 6pm-8pm at the Super Hero Foundry. We’re looking forward to shooting with you!! I’ve been involved in organized sports since I was a kid: little league, bowling, wrestling, and Judo. I had to attend tournaments for all these events. It wasn’t until I was about 16 that I met some real competitors. A couple of guys and a woman in their early 30’s. They had heard about our class and came back to try competing in Judo again. I had competed in a few Judo tournaments. Our class was in a Jr. High School and taught by one of the school’s teachers. Our classes were never about true training for a tournament. But when these three new students arrived, I saw how they changed their sessions as the tournament neared. Their styles became more aggressive and powerful than how we practiced. They were training. After the competitions, they changed gears back to working out and practicing. It was then that I realized there was a difference between working out, training, and practicing. There is an evolution from working on the basics to training for the real conditions of a competition that involves a personalized plan. Once I learn the basics, I must work out. I have to build my body and knowledge base until I am skilled enough to perform without focusing on the basics. Then, I’m ready to hone my skills through practice. Lastly, I must train in conditions that closely match the competition. I’ve been throwing for about 2-1/2 years. I have never thrown steadily for more than 3 months on a good range. Over the winter is one time most people don’t get to throw. I’ve had the same problem. So every spring I start getting out before the Blade Aces event in Vegas and try to prepare for the competition. I need to get into shape. My throwing muscles are weak. I have to retrain my body to the proper throwing posture and form. My mind needs to remember the timing, the rhythm, how my posture should be. And more. I know before even stepping onto the range that I couldn’t stick 3 knives from 6 or 7 meters. Combined. I know how to throw, I could teach someone how to throw, I just can’t throw. I am totally in workout mode. I get my knives and hit the range. My posture is awful, my muscles have fallen back into their old, bad habits. My timing is non-existent, I’m awkward, accuracy is a faint memory. I am not even concerned about scoring myself. So I start at 2-3 meters. I may throw ½ spin for 10 minutes. Never getting over 8 points in 3 knives. Even if I even stick all three. Then I go to 3m for ten minutes. I’m getting better. But I’m still not confident about my distance, at 1 spin, and I think I’m throwing too fast. I just pass on 4m because I’m sucking at my 1-½ spin. I keep over spinning and I’ve moved up to 3.6m. I go back to 5m, and I can stick 2 out of 3 in the 2 ring, barely. Throw at 6 and 7 meters? Forget it. I throw for another 10 minutes at 3 and 5 meters, because I can’t do anything but slap knives at 4m. I’m tired, frustrated, and I think I have some soreness coming on. Not even 45 minutes, and I’m shot. I need to work out. After a couple more weeks on the range, I’ve found my distances through 5m. Instead of moving around, I’m realizing that my knee wasn’t bent, or I leaned, or my arm was locked. I figured out my ½ spins were suffering from a bad grip and throwing too hard. My timing is getting better, I’m forcing my proper throwing posture less. When I make a mistake I’m figuring out how to correct it faster. My mind is coming around and I’m realizing what I need to do, but my muscle memory is slow to return. My accuracy is only improving because I’m technically throwing better, not controlling better. Trying to aim at this point usually just screws me up. I’m still in workout mode. I am sticking 2 out of 3 or better at 6 meters, but I can barely keep it inside the 2 ring. I can randomly stick at 7 meters, but usually below the bullseye if on the target at all. After another couple of weeks, I’m still throwing my distances erratically. I may start at 3m for 9-15 knives. Then move back to 4m for 15-21 throws. I keep going back like this. Deciding how many times I want to throw by how it feels or how well I think I’m throwing. I may stop after throwing 6-9 knives at 6m and 3-6 knives at 7m. I do this two or three times. I can stay out for over an hour now. There is still no formal pattern to my throwing. I’m focusing on my aim more up front and trying to keep it in the 3 ring at 6-7 meters. As my timing, strength, and posture improve and become second nature, I can focus on my accuracy. I still just throw for the 3 ring as I get back farther and work on my problems past 5m. Within another month, I should be at a point where I am not constantly hindered by my bad habits. My posture, form, timing, and strength are now at a level where I do not have to primarily focus on them to perform well. I can consistently throw a whole set from 2-7 meters without dropping more than 2-3 knives. I am ready to practice. I now need to focus on my accuracy and scoring. I am throwing well through 7m, but my accuracy is still poor. Now is the time for some training exercises that focus on setting accuracy goals. I begin close and move back. One exercise I like starts at 2m. I can only move to 3m after I’ve got 15 points. Then 14+ points at 3m, 13+ points at 4m and 5m, then 12 points at 6m and 7m. It may take me a week before I can get to 6m or 7m in one practice session. Even once I do succeed, I won’t do it every session. Another exercise I like starts at 2m on the left target. Throw. Move to 3m on the center target. Throw. Move to 4m on the right target,. Throw. Collect my knives. I start the same pattern at 3m on the left target and end at 5m on the right target. I follow this pattern until I’m back at starting at 2m on the left target. This exercise helps my accuracy as I change distances. The greatest adjustment for me is from 7m down to 2m. This exercise has helped my problems with that adjustment. Eventually, after warming up with an exercise or two, I’ll throw a complete competition round. After a few weeks of throwing competition rounds, I will begin scoring myself. I will start throwing a whole event round and recording my scores. One of my greatest motivators is competing against myself. Calculating and following my average tracks my progress and reveals weak areas in my throwing. Tracking my average also keeps moving that goal post ahead for me. The better I do, the better I have to keep doing. I will now primarily practice throwing competition rounds, recording my scores and updating my average. I will occasionally throw some exercises to increase my stamina. The exercises can also be played as competitive games when I have someone to throw with. The gaming helps my skills while putting me in a different rhythm. Sometimes, I just go throw for fun without any pressure to do well. Now, while I am going through the above steps for conventional knives, I am also working on my no-spin and hawks. I might mix hawks and conventional one day, and conventional and no spin the next. I usually just throw once a day, sometimes more on the weekends. I should be able to go out just about any time, throw a warmup set, and be ready to throw a respectable competition round in any event. About 4-6 weeks before an event is when I want to begin training for a tournament. To me, tournaments are not a vacation. A vacation is where I get to do what I want when I want. I wake up when I want, I have no schedule to follow, I eat and sleep when I’m ready. But not at a tournament. Tournaments are stressful. I’m in a different place and time zone. I’m not throwing when I want. I will have to throw at times I’m unaccustomed to. It’s not work, but it’s not a vacation either. With all that stress, I have to throw well. But, It’s nothing like how I practice at home. I have to throw 3 events in one day. Some events don’t have a warmup set; I may have to throw a cold set 5 times in just one event. Others have a warmup set, and then I have to throw 4 more competition sets; that’s 75 knives in a row, on someone’s commands. I have to go beyond practice, I have to train. I must replicate the conditions I’ll face at the competition. I go out cold, throw one set, and record my scores. I then throw 4 more sets and record the scores. My first set is most similar to a cold, head to head match. I can now keep a “Cup Average.” I add this score with my next three sets for a cold round score and calculate a ‘cold average.’ Then I add the 4 last sets for a conventional round score. That score is calculated into my average. But I still haven’t come close to competition conditions. Normally, at home, I throw, walk up, score as I pull, and write down the scores on my way to the next distance. Sound familiar? That ain’t the way it happens in competition, though. I wait to throw, I throw, I wait to go score, I wait for the knives to be scored, I pull my knives, I wait at my next distance. If someone appeals a score, I wait even longer. So how do I train for that? I throw, I count to 5-10, I walk up, score it, wait for a second or two, pull my knives, go to my next distance, count to X, get ready, and throw. Slow, boring, the risk of distraction, too much time to think between throws? Well, that’s the rhythm of a tournament. If I’m unaccustomed to these delays and distractions, I might get anxious, or jittery. I must be conditioned for spare time in between throws or I will want to go faster, but I won’t be able to. Nothing good can come of that mindset. I have to train to ignore the pauses. I have to train to focus on setting up my throws without overthinking. Don’t think about my score. Don’t worry about my last throws. Every throw is starting from a score of zero. In training, I have to throw more too. I have to build my stamina. I have to throw a 5 set round at lunch of hawk, conventional, or no spin. Then, I have to do one round after work of a remaining event. On the weekends and holidays, I will throw before 9:00 am, late morning, and in the evening to get three events in a day. Rest is also important. I rarely practice or train more than three days in a row. When I’m working out, I may throw 5-6 days in a row, because I am not forcing myself to throw 200 times or more a day. I’m getting into shape slowly. It’s not a rigorous schedule. But, practice and training should be stricter and more physically demanding. Weather and life will impede throwing, but not always enough to rest and recuperate. This is my personal plan from a general outline. I hope you can take this information and develop a plan to make your throwing better at home and in a tournament. Get strong. Get Accurate. Throw for the money. 11:59 pm – Early Registration deadline – all registrations received after midnight will incur a $25 late fee. 7:00 pm – Wedding Vow renewal of Leslie and Jim Leone at the Little Chapel of the West on Las Vegas Blvd. everyone invited! 9:00 pm – Meet up at Stoney’s Rockin’ Country at Town Square across the freeway from Blade Aces HQ. There may be a small cover charge. Must be 21+ to enter. The massage therapist will be available by appointment. Last appointment for massage therapist will be at 3:30pm. UPDATED WEEKLY: 3/03/18. With less than 2 months to go, the Blade Aces Game of Throws Knife & Ax throwing Championships will be the biggest knife & ax throwing championship ever held in Las Vegas. The event will take place at the Blade Aces HQ at the Superhero Foundry on April 20-22, 2018. The final day of registration is Thursday, April 19. Because we need the names from all registrations ready to go for the brackets of the Golden and Silver Aces on Friday morning, there will be a late fee of $25 applied to any registrations received after April 19 at midnight. In order to respect other guests planned activities during this weekend, we will start and end on time every day. There will be a General Information Meeting on Thursday night at 6:00 pm to go over rules, events and answer questions about the Blade Aces organization. We will also allow potential members to sign up for the Blade Aces membership (free of charge to competitors) and distribute registration packets to paid competitors. Starting on Friday at 8:30 am with a Throwers and Scorers Meeting, the first event will be the Golden Aces Knife throwing for the Pro Division and the Silver Aces Knife throwing for the Amateur Division. The Golden Aces Event will take place in the indoor Pro Range and the Silver Aces Event will be in the outdoor Amateur Range. The Axe throwing events for Golden Aces and Silver Aces will take place right after the Knife throwing events. There will be a wedding vow renewal ceremony for Leslie & Jim Leone at the Little Chapel of the West on Las Vegas Blvd. Everyone is invited to join us! Guests are invited to join us after the vow renewal at Stoney’s Rockin Country at Town Square located across the freeway from the Superhero Foundry at 9:00 pm. Saturday’s events will start at 8:30 am with a Throwers and Scorers Meeting. The first event will be the Conventional Knife Throw with the Pro Division taking place at the indoor range and the Amateur Division taking place at the outdoor range. Conventional Ax throwing for Pro division will also take place at the indoor range and the Amateur Ax throwing division will likewise be at the outdoor range. First prize for Conventional Pro Division Knife and Ax is $500 each. Second place is $300 and third place is $100. The Pro-Am No Spin Knife throwing event will take place right after the Pro-Am Divisions knife throwing event and before the Ax Throwing event. First prize for Pro Division No Spin Knife is $500, second prize is $300 and third prize is $100. Saturday night will be the Game of Throws Feast, Costume Contest, Special Auction to raise funds for Adam Celadin and Championship Awards ceremony. There will be beer and coolers available for sale with a portion of the proceeds to benefit the local Veterans Transition Resource Center. We are also celebrating the birthday of Dan Pegg and the wedding of Sylvain Guenegou from France. After the Feast, we will continue the evening with more throwing games, in-house poker and more! Sunday’s events begin at 8:30am with a Thrower’s meeting. The first events will be the Silhouette Game and Trick Throw at 9:00 am. Roulette and Quick Draw at 11:00 am. There will be demonstration games happening from 9:00 am until 3:00 pm such as AtlAtl Throwing and The Killer Grand Prix. Rules and video coming soon. A variety of adult beverages will be available for a small donation during this event. Must 21 years old and show proof of age in order to drink alcohol. A portion of the proceeds will be donated to benefit the Veterans’ Transition Resource Center. NO OUTSIDE ALCOHOL is allowed on the premises. Professional, Amateur and Youth Divisions in Mountain Man style Knife & Tomahawk Throwing. With performances by International Knife Throwers Hall of Fame World Champion Christopher Miller and Sarah Miller of Bandaids and Blades! Knife length is a minimum of 12″. Knives also must have a leather, bone, stag or wood handle/scales, no synthetic materials. Pre-register before May 19, 2018 and receive 10% off. For sponsorship opportunities for this event, please contact Chris Miller at cmiller13.ikthof@yahoo.com. LAS VEGAS, NV (Feb 5, 2018) – BladeAces.org has announced that it will be holding the first ever Knife & Ax throwing Championships at the World-Famous Buffalo Chip during the Sturgis Motorcycle Rally August 3 to August 12, 2018, from 9am until 3pm daily. The Buffalo Chip Blade Aces Championships held at the free-access CrossRoads will be the largest knife throwing event ever attended. Team Blade Aces is extremely excited to be a part of the Buffalo Chip entertainment family and to hold this event at such an amazing venue. Headquartered at the Superhero Foundry in Las Vegas Nevada, BladeAces.org is operated by the World’s Highest Ranked Knife Throwing Couple, Melody & TJ Cuenca. Melody is an eleven-time world knife throwing champion. They will also be joined by International Knife Throwing Hall of Fame World Champion, Chris “The Killer” Miller and other champions as well. There will be four major events happening at the Blade Aces booth including the Amateur rules conventional knife and ax throwing event, Quick Draw competition and an atlatl throwing demonstration. The Quick Draw Competition is a head-to-head competition between two competitors throwing at two wooden targets wired to an electronic timer. The fastest clocked time of the week at the Quick Draw Competition will win the magnificent Buffalo Chip Quick Draw Trophy. The 2,500 sq ft Blade Aces booth will have 12 targets and four lanes of knife and ax throwing, two designated Quick Draw targets and the atlatl exhibition lane. Classes are just $20 for a 30-minute lesson, $40 to enter the Daily Knife and Ax Competitions, and $10 for three tries at the Quick Draw Competition. This event is open to the public and everyone is welcome to enter. Members of Team Blade Aces will also be performing exhibitions of knife throwing, whip cracking and gun spinning at the various concert stages and locations all throughout the Buffalo Chip. 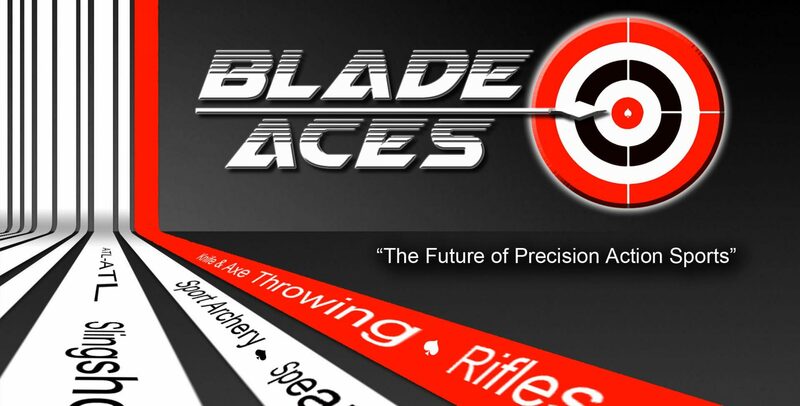 Blade Aces is an organization with one mission in mind: To design, create and build the most professional, standardized, and fun precision projectile sports organization in the world. Designed by professional competitors for professional competitors, the Blade Aces organization is a non-political, commercial entity that does not shy away from committing to competition from all over the world. Blade Aces hosts competitions for: Knife throwing (Spin & No Spin), Ax/Tomahawk throwing (Tomahawk & Small Axe), Large ax (Single and Double Bit), Archery (Long Bow and Compound), Atlatl (Traditional and Modern), Throwing stars (Small and Large), Spear (Lance and Javelin), Boomerang (Hunting boomerang and Throwing Stick), Blowdarts (Short and Long Blow gun),Sling (Ancient and Modern), Rifle (Air and Gunpowder), and Pistol (Air and Gunpowder). The Sturgis Buffalo Chip is the Largest Music Festival in Motorcycling™. Established in 1981, the venue’s nine-day festival, known as The Best Party Anywhere®, remains one of the world’s most televised and longest running independent music festivals. Buffalo Chip guests have the freedom to party and play while experiencing world-class concerts, outrageous events, moving freedom celebrations, thrilling PowerSports and more. Located three miles east of Sturgis, SD on 600 creek-fed acres, it offers cabins, RVs, camping, a swimming hole, bars, mouth-watering food, showers, paved roads, and more to visitors traveling from all corners of the world. The Chip’s concerts are free with camping. More details are available at http://www.BuffaloChip.com. NOTE: A portion of the proceeds from this event will benefit Semper Fi Fund.org. This will be the third fundraising event that we’ve held for Semper Fi Fund and we are proud to support their mission to assist wounded members of the US Marine Corps and their families.